Middle finger or the Mount of Saturn. The Mount of Saturn: It’s interesting to notice that, mount of Saturn plays a significance role for any individual life as it is connected to the extraordinary talent and the success or respect in life of any individual mankind. Mount of Saturn or its base is located at root of the middle finger. Mount of Saturn is called the deity of good luck because the fate line ends at its base. If the mount of Saturn is well developed than it makes an individual very fortunate and helps in getting success without much effort. If the mount of Saturn is not much developed, than they remains aloof and constantly moves forward towards their goal. And really face difficulties in their ways. And sometime, if the mount of Saturn is very much developed, than they commit suicide, and becomes very low minded people. They do not care about their friends and family, and they can commit any crime for their silly benefits even. If the mount of Saturn is absent on any palm, than such person's life has no importance and really face many problems in his plans due to this their life becomes unhappy and non religious. If the mount of Saturn is well developed and the finger is tipped and pointed, then they become to be very imaginative. But if the finger is squarish than they work great in agriculture and natural sector. 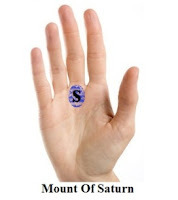 For any palmist it is very important to observe the mount of Saturn as it shows lot about life and success.